"This is one heck of a cookie! This is a very thick dough. It is mixed best with a table top mixer." Place margarine in a large bowl. With an electric mixer, cream for 30 seconds. Stop and scrape bowl. Add sugars and cream for 2 minutes. Stop and scrape bowl. Add eggs, vanilla, and maple syrup. Mix for 2 minutes. Scrape bowl. Add all-purpose flour, whole wheat flour, graham cracker crumbs, baking soda, baking powder, and salt. Mix on low for 1 minute. Add oatmeal and mix on low for 1 to 1 1/2 minutes, until thoroughly blended. Add chocolate and nuts. Mix on low for 30 seconds, just until blended. Drop by rounded teaspoonfuls onto greased baking sheets. Bake at 350 degrees F (175 degrees C) for 8 to 10 minutes. Cool completely on wire racks. 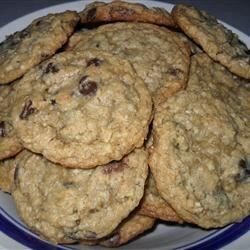 These cookies are bursting with oats, peanut butter, and whatever else you love!